John Peter Seitz was born on 8 April 1860 in Brooklyn, Kings County, New York. He married Rosina Zeifang, daughter of Marcus Zeifang and Ursula Stähle, circa 1892. He was a furniture dealer, according to the 1900 census. Marie (?) became a widow at his death. The following appeared on 30 March 1908 in the Niagara Falls Gazette: Peter Seitz, 86 years old, for fifty years a resident of this city, died yesterday afternoon about 3 o'clock, at the home of his son, John Seitz, at No. 918 Niagara avenue, after a lingering illness. Death was due to old age. Besides his wife, the deceased leaves three daughters, Mrs. William Eimer, Mrs. George Cosby and Mrs. Christ Shoemaker, all of this city, and one son, John Seitz. The funeral will be held from the home of his son, tomorrow afternoon at 2 o'clock. The Rev. Herman Brezing of the Zion Lutheran Church will officiate. Burial will be made in the Oakwood cemetery. Rosina Zeifang became a widow at his death. John Peter Seitz died on 23 November 1909 at age 49 in Niagara Falls, Niagara County, New York, at 918 Niagara Avenue at his residence. 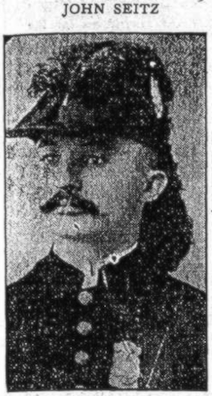 The following appeared on 23 November 1909 in The Niagara Falls Gazette: John Seitz, a resident of this city, for more than 35 years, died suddenly of heart failure at his late home in No. 918 Niagara avenue at 1:30 o'clock this afternoon. Mr. Seitz had been ill for the past two days with a severe cold on his lungs. Early this afternoon Dr. L. H. Teeter was summoned and while the physician was preparing some medicine, Mr. Seitz passed away. He was 49 years old. Born in Brooklyn, N. Y., on April 8, 1860, Mr. Seitz came to this city with his parents about 36 years ago. Nearly 22 years ago Mr. Seitz began business as an undertaker at the then village of Suspension Bridge. He has been engaged in that work to the time of his death. He is survived by his wife, who was Miss Rose Zeifang, his mother, Mrs. Mary Seitz, and one daughter, Miss Marie Seitz. Three sisters, Mrs. William Elmer, Mrs. George W. Cosby and Mrs. Christopher Schumacher, all of this city, survive also. No arrangements have been made for the funeral but they will be announced later. The following appeared on 24 November 1909 in The Niagara Falls Gazette: At 2 o'clock tomorrow afternoon the funeral of the late John Seitz, who died very suddenly at his home yesterday afternoon, will be held from the family residence, No. 918 Niagara avenue, at the Zion Lutheran Church at 2:30 o'clock. The funeral services will be conducted by the Rev. Herman Brezing. The funeral will be attended by Niagara Falls lodge No. 81, I. O. O. F., and Camp Lowry, W. O. W., in a body. The deceased was a prominent member of both organizations. Interment will be made in Oakwood Cemetery. The following appeared on 26 November 1909 in The Niagara Falls Gazette: The funeral of John Seitz was held from his late residence yesterday afternoon. A large number of friends of the deceased attended. These included members of Camp Lowry, Woodmen of the World, and Canton Cataract, I. O. O. F., who attended in a body. The cortage moved from the house, No. 918 Niagara avenue at 2 o'clock to the Zion Lutheran Church, where the services were held. These services were conducted by the Reverend Herman Brezing, pastor of the church. The ediface was filled with friends of the deceased who, by their presence gave silent tribute of the esteem in which Mr. Seitz was held. The interment was made in Oakwood cemetery. The pall bearers were Henry Schwenk, Charles Ford, Martin Mayle, William Turner, William Kirkpatrick of this city and C. G. Cuddaback of Youngstown. Among the out of town people who attended the funeral were Mrs. Leo Stevens of New York, Mr. and Mrs. Charles Evans, Florence and Arthur Evans, Captain and Mrs. Greaser, Charles Hornig of Buffalo. The following appeared on 13 December 1909 in The Niagara Falls Gazette: The will of John Seitz has been filed for probate. Wm. C. Edwards is named as executor. The estate consists of $1,000 personal.